We manufacture Replacement Sealed Units. We remove your old window and not hide it. Ask for Bill - The Friendly Glass Guy!. Certified Journeyman Glazier and Certified Auto Glass Installer. FREE ESTIMATES. If it has glass in it, we can fix it. WHY PAY MORE? When choosing windows for your new home or renovation jobs it is important to know what to ask & yes all windows are not created equal & you do get what you pay for. All new windows these days have vinyl frames & yes they have low e glass too. But it is what you can't see is what is important & is hidden within the vinyl frame. If you were to cut you new window frame in half what would you see? Chambers within the frame it's self. These chambers create dead air space which gives the frame more energy efficiency. The more sealed chamber the better & our supplier has five unlike our competition's two. Also how long is the warranty? our supplier is a written lifetime. So when you are looking for a estimate ( which ours are free ) it does pay you back in years of savings to ask the question before you purchase the wrong manufactures product. When you call us for your FREE estimate, we will be glad to show you the difference in the window market place. Other things to know about & ask questions before doing your project. It has been brought to our attention that some of our competition has been stretching the truth about their Manufactures Warranties. When some of our competition are selling a cheap window & they are a cheap window. Some of our competition are telling potenial customers things that are not true. They are now giving a personal guarantee's that their windows will not sweat in the winter months. But for you the consumer it is all about your money, is what it is about. They are willing to say what ever they have to to get the job. We have read some of our Competing Manufacturers warranties & they read clearly that no DEALER OR INSTALLER can make any claims outside what is placed on the manufacturer's warranty sheet. 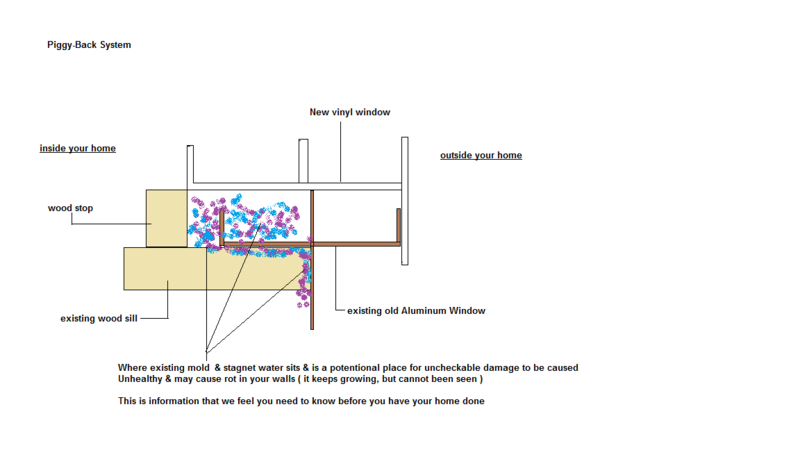 IF a company does tell you that they personally guarentee that his windows will not sweat, But in the winter they do!! What happens ? Probably nothing as the installing company is going to come back to you home, look at it & probably say it's nothing I did & you will then be told to call the supplier ( Manufacturer ). They are going to tell you that the installer had no right to make claims on behalf of the Manufacturer. Bottom line is you the consumer is going to be stuck with this poor quality window forever. We are suggesting that you ask to see the manufatures warranty sheets before choosing a brand & a company to do our home. Some companies are also saying & advertising that their windows come with a lifetime warranty. But when you do read the Manufactures warranty sheet, it really is for only twenty years ( not lifetime ). You should also ask if the Manufacturers make all components for their windows themself or have other companies make portions of the windows for them. If the company does not make all it's own products, then you the customer are again at risk of not being covered. What if the companies sealed unit supplier goes broke. You are left holding the bag. We at Proline Glass Ltd. feel it is part of our job to inform our potential future customers on things to look out for. So getting your homes windows changed is a happy undertaking & that you do get a quality product which is going to save you money over time & is trouble free too. We are just trying to give you the tools to be a informed customer. Ask allot of questions & listen hard to the answers you get to make a informed choice. More Facts to consider before making your choice of company to preform your new vinyl window installation.We feel that companies that offers to install your new & expensive vinyl windows using the piggy back system are not doing you any favours at all. All this does is to make the job easier for themselves ( get in & get out ). Grap the money & run. Yes this method makes the PRICE look cheaper. But what it does for your home is the following, #1) - Makes for a very combursome finish inside. #2) - If your existing aluminum window was sweating & moldy now, it has been hidden with your new vinyl window installed over it. #3) - In years to follow this mold is going to continue to grow without you being able to see it for one & never being able to clean it because the new vinyl window hides all of this. #4) - Years down the road we do feel that this mold having grown for now years may cause you more unexpected expenses such as possible dry rot in your walls, which means a even more expensive repair & repairs to walls( possible structureal ) within your home caused by these lovely new vinyl windows that were installed incorrectly years ago. It is in our opinion that yes you do get what you pay for in this world & it does pay to be informed so that you can make the right decission on one the product that you choose & secondly what company & what methods that they are going to use to install your new vinyl windows. We are including a picture below for you to look over & this shows what happens when using this piggy back system. It does pay to be informed these days & know what questions to ask.